Nazara Games Quite Popular For Kids Games. Dozens Of Kids Games On Favorite Cartoon Character Developed By Them. Like Chotha Bheem, Mighty Raju, RCB Cricket, Rohit Cricket Etc. 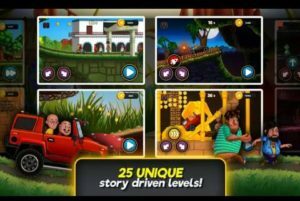 Recently, Two New Motu Patlu Games Released By Nazara Games. First One Is Motu Patlu King Of Hill Racing, Second Is Motu Patlu Speed Racing. 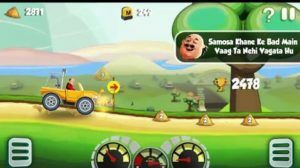 If You Have Ever Played Hill Climbing Racing Then You Can Guess The Game Play Of Motu Patlu King Of Hill Racing. In This Game, Over 3 Themes/Locations Are Available Where You Drive. More Than 4 Vehicles Like Car, Bike Are Available That Can Be Unlock With Samosas. Other Characters Of The Game – Motu, Patlu, Chingum, John. At The Begining, You Play As Motu And Race With Chingum. It Is The Full Copy Of Hill Climbing, Only Characters Are Different. You Have To Collect Samosas, Control Your Car/Bike. You Can Use Samosas To Continue Where Your Game Over Or In Unlocking Of New Locations. Gameplay Is Smooth, But Game Controls Sometimes Stuck. This Motu Patlu Game Contains Ads, In-App Purchase. You Can Download It From Here. Game Size Is Under 30 MB. Another Game Is “Motu Patlu Speed Racing”. It Is Currently In Beta/Early Access Mode On Google Play Store. This One Is Quite Interesting As Compare To Motu Patlu Hill Climb Game. The Game Comes With Many Locations, Boosters Like Rocket, Chingum’s Bike. There Are 5 Unique Worlds Featured In This Motu Patlu Game – Furfuri Nagar, Egypt, Jungle Etc. Along With Locations, Variety Of Cars Also Available. To Unlock Secret Level You Need To Collect Pieces Of Puzzle. You Should Try This Game Instead Of Motu Patlu Hill Climbing Racing Game. You Can Download Motu Patlu Game From Here. Game Size Is Just 32 MB. And It Is Totally Free. Both Games In A Short Time Hits Over 100 Thousand Downloads On Google Play Store. Like Our Facebook Page – MrGuider, Follow Us On Twitter – @techhuntr, Subscribe Us Via Email To Get Latest Updates Of New Games. Play Motu Patlu Game On PC Using Android Emulators.